This drawing was never really going anywhere. So, as I have nothing else to show, I'm posting it half finished. I could have worked on it some more, but I know that it would be a pointless task. I think this is probably the best it's ever going to look. Which ain't great. But, there we go. Win some lose some. It does have one moment that I particularly like, though. The finished key on the left. Hmmm. I kinda like that. 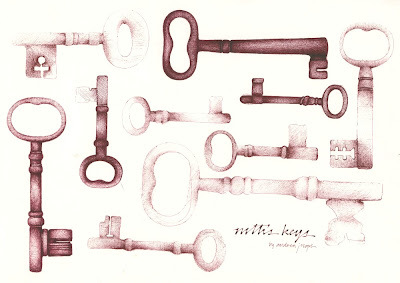 I like this drawing and agree, the key on the left is very nice! Is this drawing part of the guessing game? Call me a fool, but I like it, and I like it the way it is. I think the faded keys (apparently, unfinished keys, though I wouldn't have known it had you not told me) near the solid ones are a neat effect, as though some doors are open and some are beyond our reach, like greyed-out options on the computer; and I like the whole composition. Some projects just aren't as thrilling as you thought they'd be. It happens. You could always cut out the one you like and put it somewhere else. I like the dark key at the top of the page too. I'm really glad you posted this. It's wonderful! Also, I like seeing your 'unfinished' pieces because it gives me an insight into how you work. But you've got swine flu?! RUBBISH! Mr Pippa had it during the summer. Praying that you shake it off soon. Your work is always mesmorizing!!! You know, it's funny but I really kind of like this one now. Sarita, this is not part of the guessing game (that's the drawings with the gridded background) but it should be! I do think that the unfinished keys do add to the mystery. And, to me, keys are always mysterious anyway. Yes, Pip, swine flu is horrible! This is amazing, it looks great to me. You're very talented! Fantastic drawing Andrea, I can't bear to do a thing when I'm ill so this is some achievement. I think the whole thing is kind of cool, actually! Especially because the keys that aren't finished look like they have frost on them or something. There is a nice variation in the values of the different keys which gives a real interest to the whole drawing. Half finished is absolutely PERFECT! I love it as it is. It's got depth, it draws me in, it begs to ask, "what of those keys?"